These two events are now joined and usually take place on the second Sunday of each month. To stay up to date, visit their website here. 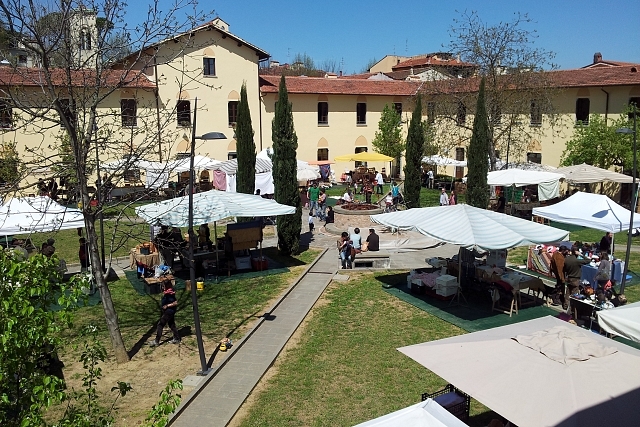 The "Fierucola" is the traditional event dedicated to nature and organic farming, and the "Lungoungiorno" is an event sponsored by the Foundation of Florence for the Arts and Crafts and entirely dedicated to high quality crafts. Together now it is a great day of art, crafts, food, tours and events. "Lungoungiorno + Fierucola" takes place at the Vecchio Conventino Space for Arts and Crafts (SAM), on the second Sunday of each month. Locals and tourists can spend the whole day with the artisans, their art, and the amazing local food. Lungoungiorno + Fierucola is an opportunity to watch artisans at work, hear their stories, and get closer to their crafts and their workshops.